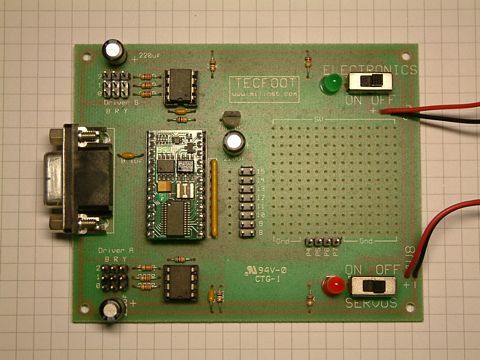 TecFoot MkII is an upgrade from the original TecFoot with some small changes to the servo horns and revised software. These changes improve TecFoot's walking and the new software flexibility allows an easy upgrade with extra sensors such as Parallax's Ping ultrasonic sensor. 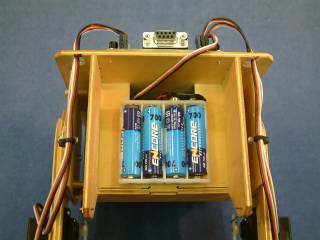 TecFoot is an educational Biped Walker designed by David Buckley aimed specifically at the beginner to electronics, robotics and animatronics. 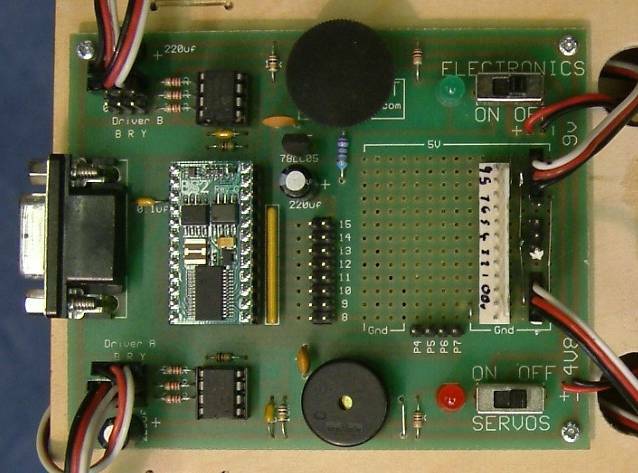 The control-board is ready assembled consequently the kit requires no special knowledge of electronics. 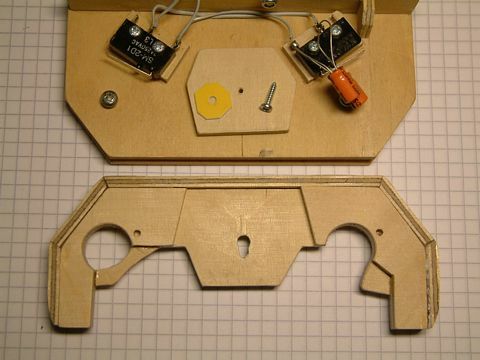 The TecFoot kit is easy to assemble using a small screwdriver, a pair of pliers and wood-glue. 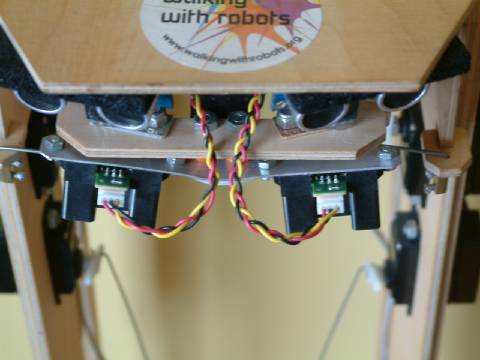 The five servos allow independent control of each foot, each leg and the splay angle between the feet. 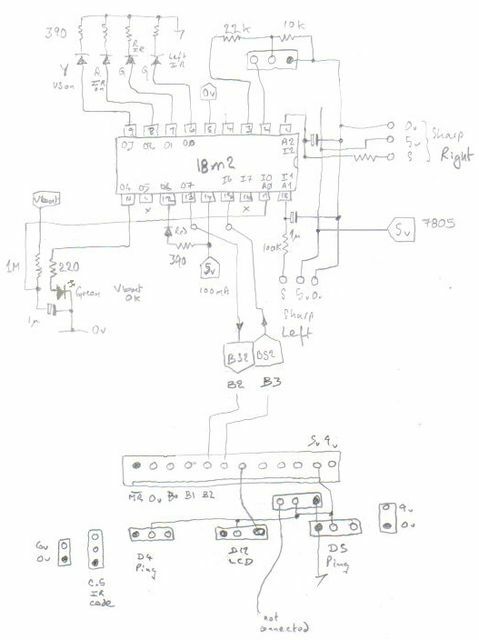 A simple fully documented Basic program is provided which passes messages to two servo-co-processors which take care of pulsing the five servos. 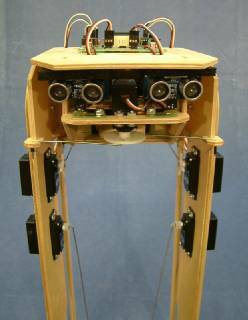 The supplied program operates TecFoot in a quasi static balance walking mode but TecFoot is also capable of operating in a dynamic mode swaying quickly from foot to foot as do humans and other animals, in this mode TecFoot walks much faster and the experimenter may choose to explore this way of walking. 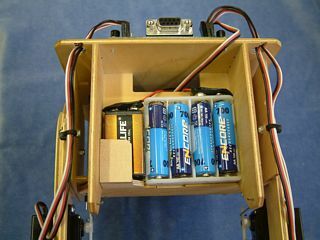 Assembly of TecFoot is very straightforward needing only a small posidrive screwdriver to alter the drive disc/horn on the servo, possibly a slightly larger one for the M4 and M3 screws that hold the servos and legs in place and a pair of snipe nosed pliers to bend the wire for the tendons. The plywood parts can be glued together using white woodworking adhesive (pva adhesive), hot melt glue, epoxy resin or cyanoacrylate adhesive (superglue) etc. but I recommend you use white woodworking glue. Study the following photographs and sort out the parts needed for each operation. Remember to make a right Foot and a left Foot and a right Hip-plate and a left Hip-plate, laying out the parts as in the photographs will help to remind you. Although it is not necessary for TecFoot to function I suggest you lightly sand paper all the parts especially the edges using fine sandpaper (e.g. 120 grit), it just makes the parts nicer to handle. when gluing protect the table top with a sheet of newspaper or similar. Not only will that protect the table but if too much glue is used and it squeezes out underneath it prevents the part becoming glued to the table. the sleeving is used to keep the pins in place, see pictures 27, 33 and 36, you will need 10 pieces each about 5 or 6 millimetres long. To prevent the sleeves working loose you can secure them with a drop of clear universal glue on the end of the wire. All the parts for the feet laid out for a right foot and a left foot. Two Soles, two Foot-stiffeners and four Ankle-supports. Glue the main Foot-stiffeners in place on the Soles. Place the Soles on a flat surface and make sure the Foot-stiffeners are pushed well down and are square to the Sole. The completed feet with the Ankle-supports glued in place, make sure they are pushed well down and are square to the Sole. All the parts for the Ankles laid out. These parts are only screwed together, no glue is used. Left to right - Ankle-side, Ankle-side, Ankle-spacer, Ankle-spacer, Ankle-side, Ankle-side. The twelve Screws are below. The Ankle-spacers screwed in place through one Ankle-side. Parts for legs laid out, from top to bottom, two Screws, Leg-doubler, Leg, Leg, Leg-doubler, two Screws. The four Screws are just used for alignment of the Leg and Leg-doublers during gluing. Screw two Screws part way through each Leg using the holes marked A so they project just less than the thickness of the plywood. Do not use the end hole in the Leg, that is for the ankle pin. Spread glue on a Leg-doubler but be careful not to get glue near these screws (they have to be removed later) and place a Leg onto it, the projecting ends of the screws should go in the holes marked B in the Leg-doubler to align the two parts. Then weight down until the glue dries. Photograph showing a Leg weighted down on top of a Leg-doubler, see side view above. When the glue has dried remove and save the Screws. From top to bottom and left to right:- Hip-top-bearing, Hip-top-bearing, Hip-plate, Hip-plate, Hip-bottom-bearing, Hip-bearing-plate (disc), Splay-horn, Splay-horn, Hip-bearing-plate (disc), Hip-bottom-bearing. Use two of the M3 screws (it doesn't matter which ones) and insert them through the holes in the Hip-plates and then glue a Hip-bearing-plate in place on each Hip-plate. The screws are only to align the discs with the plates, make sure the screws are square to the plates, do not get glue near the screws and when the glue has dried remove them and keep them safe. Glue the top and bottom bearings in place as shown. Make sure the Hip-top-bearing is pushed fully down into its slot and similarly make sure the Hip-bottom-bearing is pushed all the way into its slot, make sure both bearings are square to the Hip-plate. Glue the Splay-horns in place on the front edge of the Hip-plate making sure they are square with the plate. Left to right and top to bottom:- Body-back, Body-bottom, Splay-plate, Body-side, Body-top, Body-side. 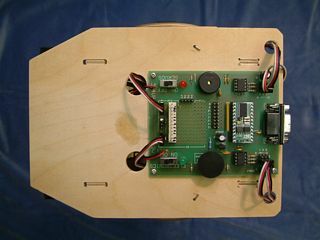 Enhancement - drill 10mm diameter holes at the rear corners of the Body-top plate to take the servo cables, and 16mm diameter holes at the front of the PCB area to take the battery connector cables. Glue a Body-side to the Body-top, making sure it is square. Without using glue assemble the Body-back and other Body-side to the Body-top as shown and mark the position of the Body-back panel where it rests on the Body-top, after marking remove the two parts. Glue in place the Body-back, placing it in the position marked and before the glue is dry, glue in place the remaining Body-side, as above. Make sure the Body-back panel is square to the Body-top and that it lines up as shown below. Make sure the tab on the Body-back panel is fully into the notch in the Body-bottom. After the previous parts are glued leave a little time for everything to dry and then glue in place the Splay-plate. 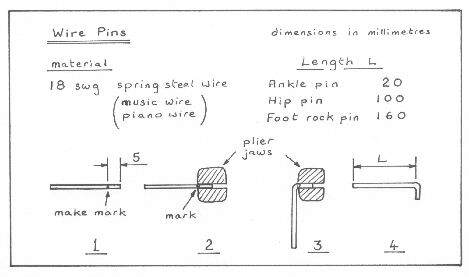 If the wire comes as long lengths plan how to cut the various pins and links so you have enough wire, if you cut all the small pieces first then you won't have enough left for all the long pieces. 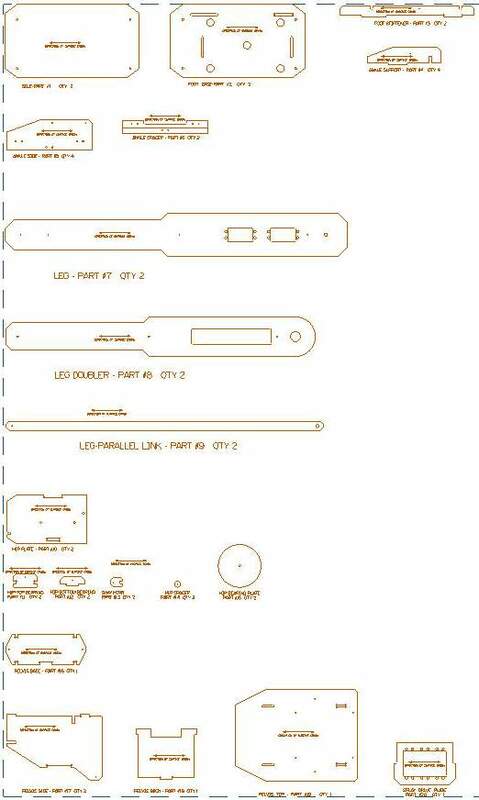 The table suggests how to cut the pieces from full lengths and the drawings show how to make the bends. 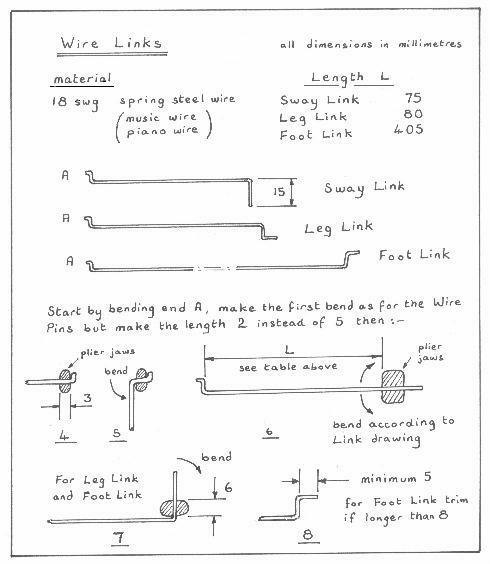 The 18swg piano wire normally comes in 18" lengths (457mm), the following allows all the links to be cut from four full lengths plus 8" (200mm) . Note - Ankle pins no longer used. The Leg-parallel-link is the long thin piece at the top of the photograph. 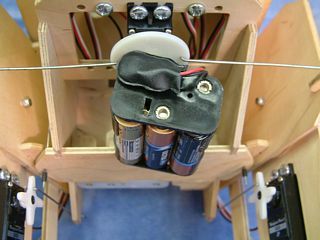 Insert two Servos into the Leg as shown and fasten in place with M4x10 screws and nuts. 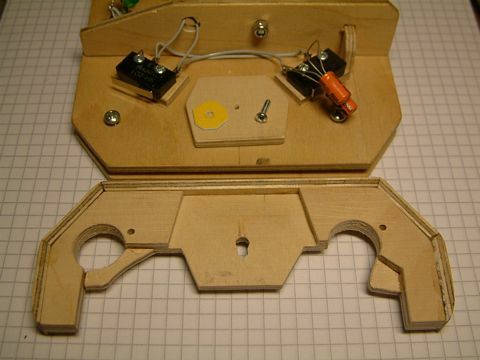 The head of the M4 screw should be against the Servo and the nuts on the plywood. If you want, lightly rub the face of the disc on the Hip-plate with candle wax or a DRY bar of soap to lubricate the joint, don't worry if you can't do this, TecFoot will still work fine. The other small parts are laid out on the foot. Two Ankle-pins and Retaining-sleeves, two large diameter 1/8inch washers, two plastic spacers, two M3 washers, two M3 nuts and the Retaining-sleeve for the Foot-rock-pin. The Foot-rock-pin itself is in place in the holes in the Ankle-supports. Note: the M3 washers are now no longer used and the M3 nuts have been replaced by M3 nyloc nuts which have a nylon insert which prevents the nut working loose. Assemble the Ankle to the Foot by inserting the Foot-rock-pin through the front Ankle-support, through the hole down the length of the Ankle ( formed by the groove in the Ankle-spacer) and through the rear Ankle-support, place a length of the sleeving over the end of the pin to hold it in place. Place the Leg and the Leg-parallel-link in the gap in the Ankle and hold in place using the Ankle-pins and two more lengths of sleeving to hold the pins in place. View from front looking at outside of ankle. View from rear looking at inside of ankle. Pins were used at the leg-bones/ankle joints because I was worried about wear of the wood from the thread if the pins were machne screws. From later robots, wear of such a joint seems negligible and using screws and locknuts means there are four less things to fall off. To upgrade ankle pivots from the wire pins drill out the holes diameter 3.0mm and replace the pins with M3x16 pan head. Use M3 nylock nuts and nip up then back off 1 turn so the leg 'bones are free to pivot. Assemble the big washers and the plastic spacers onto the M3x16 and M3x12 screws as shown. Insert the screws through their respective holes in the Leg and Leg-parallel-link and fasten them to the Hip-plate. Note the picture shows the M3 washers and plain nuts but these have now been supercede by the M3 nyloc nuts. Put the M3 nuts on the inside and screw up until the Leg doesn't waggle about but still moves freely. When the screw comes up to the nylon insert in the nut it will be stiff to turn and you will need to hold the nut with a small spanner or a pair of pliers. 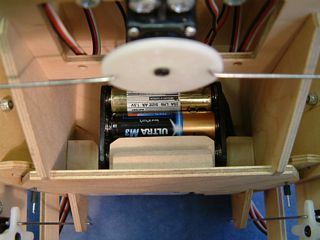 Fasten a Servo in place as shown using M4x10 screws and M4 nuts. Photograph shows the Body, two Hip-spacers (little disks), two Hip-pins, and the two leg assemblies. Assemble the Legs to the Body threading the Hip-pins down through the top of the body, through a Hip-spacer, the top bearing on the Hip, the bottom bearing on the Hip and through the Body-bottom. Retain the pin in place with a length of sleeving. Recomended enhancement [1 March 2008]. Add a 10mm dia 1.5mm (1/16inch) thick plywood washer between the bottom bearing on the Hip and the Body-bottom. This removes up and down play at the hip pivot and aides smoother walking. For each leg insert the big end of the Leg-tendon through the horn at the bottom of the Body-side. The end of the wire should go easily through the hole in the plywood but then you will have to push a bit to get the corner in the wire through the hole. 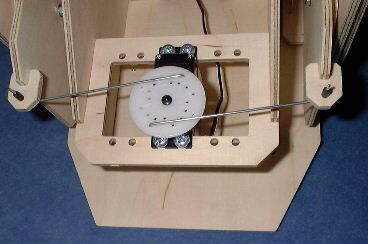 Then insert the small end of the tendon through the Servo-horn as shown. Recomended enhancement [4 March 2008]. Use the small 'cross' horn with the wire through one of the holes nearest the boss. Push the horn onto the Servo shaft but don't yet put in the screw. 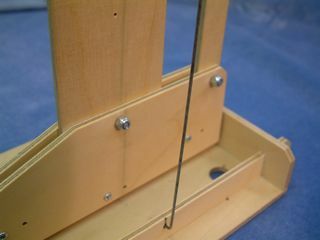 Insert the small end of the Foot-tendon through the fourth hole from the end of a long Servo control horn as shown in image 34 and the big end through the Foot-stiffener, again you will have to push a bit to get the corner through. Push the Servo horn onto the Servo shaft but don't yet put in the screw. 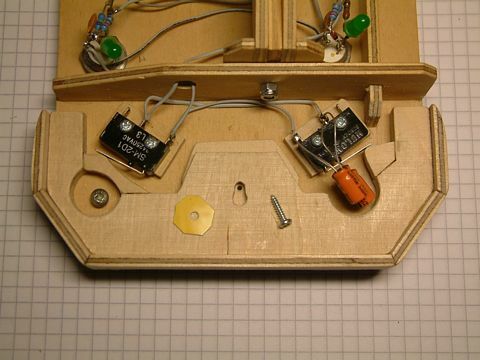 Fasten the Circuit board to the top of the body using four screws, just screw in the screws until the board doesn't rattle about, it doesn't have to be tight, it won't fall off. 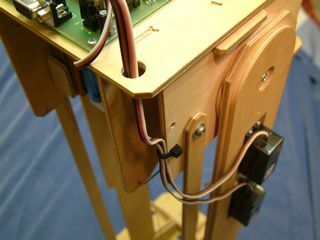 the splay Servo plugs into position 2, route the cable round the other two so it doesn't get in the way of the cable to the D9 connector. Route the cables through the holes as shown. If you are going to use extra sensors such as the Parallax Ping Ultrasonic-sensor then the 9v battery shown will not last long with the extra power required, see the 6xAA battery pack below. If you decide to use the larger 6AA pack for the electronics then use sticky pads to stick down the 4AAcell holder in the centre of the back as shown. Central, the mass of the battery is not offset and it makes it easier to get your fingers to the end AA cell. 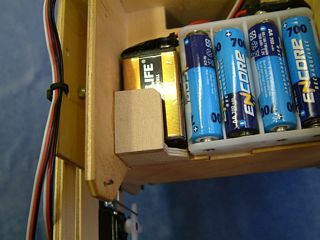 Otherwise using sticky pads stick down a 9 volt battery and a battery holder for four AA cells on the rear as shown. Alternatively make a support bracket for the 9v battery. 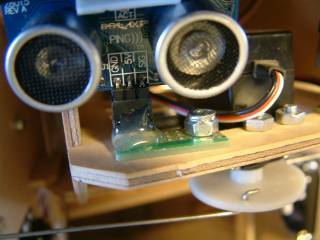 Use a wire tie through the 4mm hole to hold the Servo leads to the Hip-plate. 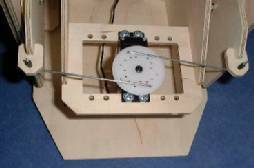 Load the program into the Stamp2 on TecFoot, it will run the manual_setup: section and all the servos will go to the above positions. Stand TecFoot on its feet and the legs vertical. Now put on the Servo 'cross' horn for the legs and screw them in place. Attach the leg-servo-horns so the wire connection is to the rear and the wire has no play but is not under tension, ie the foot is still flat, and screw them in place. 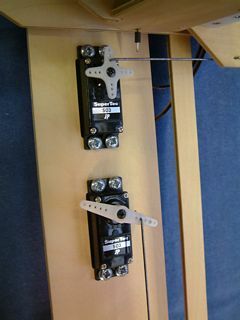 Picture #40 below shows the position in which to attach the Leg Servo horns, whilst picture #36 above shows the position of the Splay-Servo-disc. 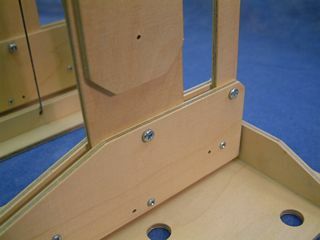 Adjust the Splay so the feet are parallel, put on the Splay-Servo-disc and screw it in place. Now the discs and horns are on in the right place, edit the mid values so the legs are vertical and the feet are flat and the feet are parallel. Now 'Dowalk' will be done forever and TecFoot will walk forward. may be necessary for best performance. Remember to save the program with the customised values. These lists are interpreted at run time. Create Poses, Acts and Dos as desired. 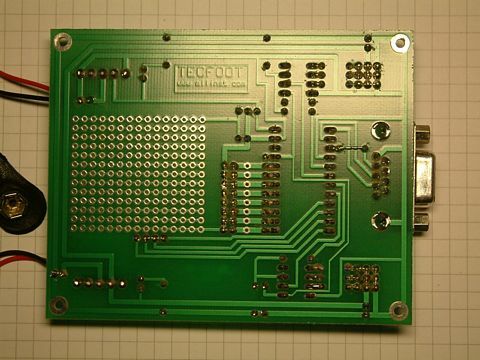 TECFOOT.BS2 was originally supplied as TECFOOT.BS2.txt in the folder TecFoot_files and as TECFOOT.BS2 so that if you had modified the .BS2 file and then wished to go back to the supplied version you could copy the file TECFOOT.BS2.txt and rename it as TECFOOT.BS2. From 13Nov07 the file TECFOOT.BS2.txt was removed and the original TECFOOT.BS2 was renamed TECFOOT1.BS2 and TECFOOT.BS2 was completely rewritten. To accord with the new software photo36 was flipped left to show the reversal of the Splay links, splayout is now +ve, whereas before it was -ve. 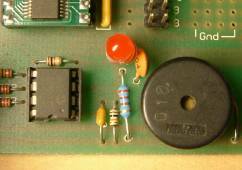 Parallax's Ping Ultrasonic-sensors require more power than can be supplied by a PP3 9v battery. There is room inside the body for a 6AA battery holder. 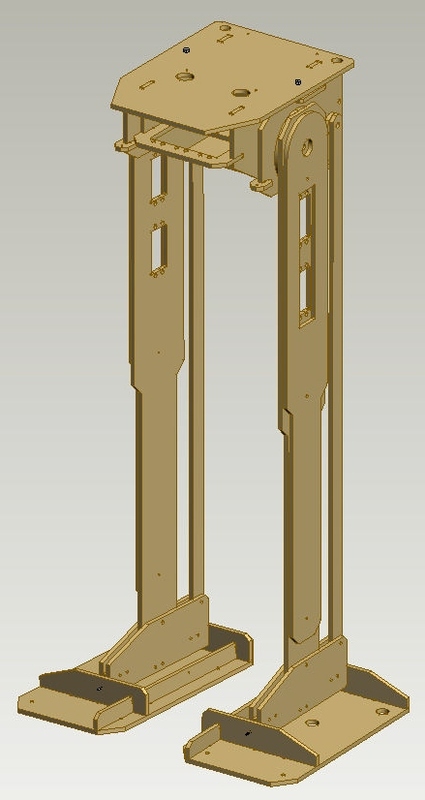 Make supports as shown. Don't make the front lip too high to get the battery-pack in place! The circuit-board has been enhanced with a 12-way bytewide connector for P8-P15; and a Piezo sounder, a 10K user pot., and three, three pin, connectors for the Ping sensors and a serial LCD using P4-P7. A further enhancement is a LED and 220 ohm resistor have been added across the speaker. The LED comes on when the Speaker is driven and can be turned on without any sound by setting the Speaker-pin High. The Parallax Ping ultrasonic-sensors are plugged into three pin sockets soldered to a scrap of PCB material and fastened using an M4 nut and bolt to the Splay-servo mounting-plate. The PCB scraps are right and left handed, the Ping Sensors are angled slightly down to avoid reflections from the top-plate peak and scraps of black (conductive) foam wedged above to stop the Ping wobbling about. (The foam was to hand and just the right size.) The three pin sockets are also secured with hot melt glue fillets otherwise they tend to break off with the vibration of walking. 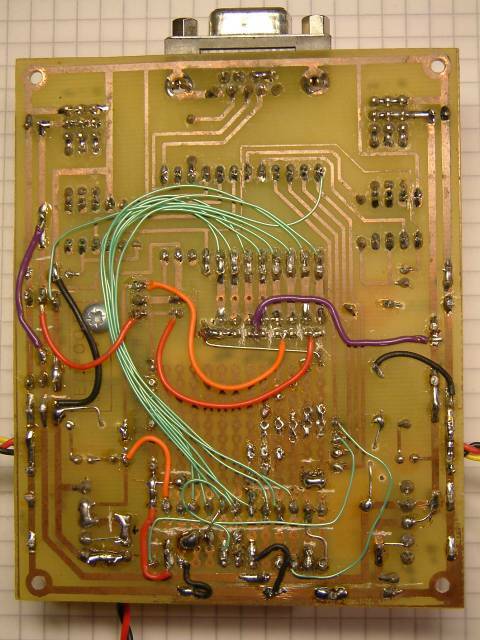 Connection to the circuit board headers is made with servo leads soldered to the PCB scrap and plugged onto the main circuit board. 48 See also photo 55 below. See also TecFootlog.htm for ongoing enhancements. As such some of the following is out of date. 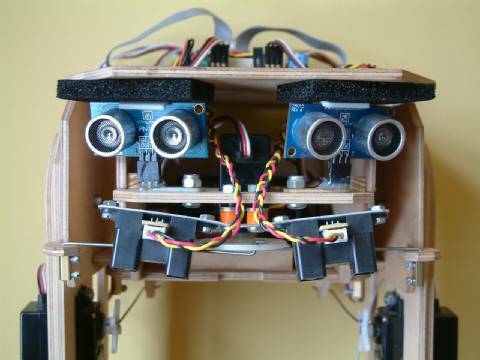 TecFoot technical information in A Minimalist Approach to Biped Walking Robots. 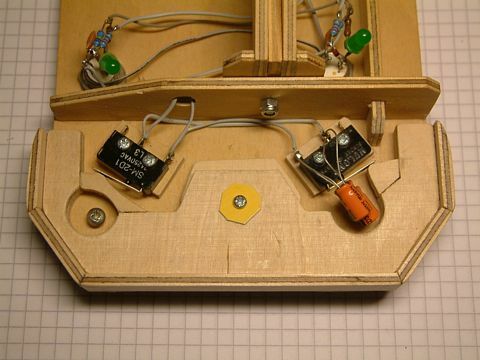 The two microswitches on each foot are wired Normaly-Open in parallel with each other and two 100uF capacitors and connected to pin9 (right foot) and pin14 (left foot). The BS2 pins 8 - 15 have 10Kohm pullups and so the 200uF adds maybe 1/4 *10K*200uF= 0.5sec hysteresis. The four undefoot sensors for each foot are wired in parallel and connected to pin8 for the right foot and pin15 for the left foot. In photo 51 the hole for the Toe-piece securing screw is in the narrow part of the hole to align the Toe when it is pushed out by the microswitch springs. The rest of the hole is wider to allow some side to side movement for when the Toes are hit on the side. The Toe-piece-securing-screw is screwed in so the Toe is clamped then backed off a turn so the Toe slides back and forth easily. Wiring to various connectors and PicAxe18x and ServoPower-good on daughter boards. 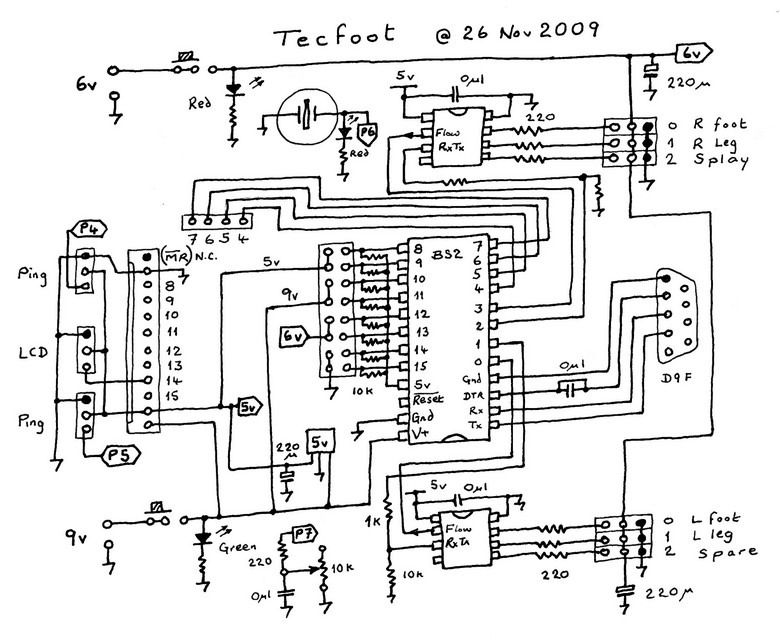 See also TecFootlog.htm for the latest wiring. Above the 12 way connector is the piggyback board for the PicAxe18x which was added to read the Sharp GP2Y0A21YK IR distance-sensors. To the left of the 12 way connector is the piggyback board for the PowerGood resistor and LED. The plaited Yellow/Red/Black cables go to the GP2Y0A21YK. Two Sharp GP2Y0A02YK Infra-Red distance sensors have been fitted pointing down to sense drop-offs (table edges, stairs), and low obstacles below the Ultrasonic sensors. 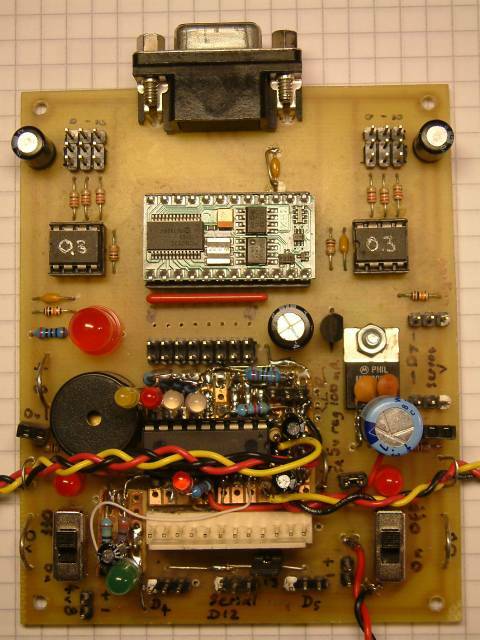 The analog output is read by the PicAxe18x coprocessor. The 18swg aluminium bracket is bent so the sensors look at the ground just in front of the toes. 14Sep09 links to A_Minimalist_Approach_to_Biped_Walking.htm corrected so they work! 08Jan09 added TF-Condor.BS2 and a note about TecFoot-P underfoot switches. 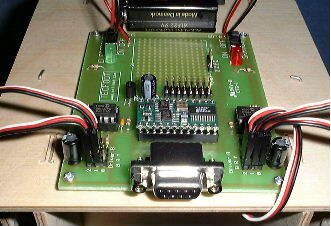 29Mar08 added TecFoot-P Toe-sensors, and stock Circuit-board photos. 28Mar08 added Installation of Ping sensors. 04Mar08 Photo #34 - use 2nd hole changed to use 4th, this uses more of the servo range and increases available torque and hence tendon pull. 04Mar08 Photo #34 - Recomended enhancement [4 March 2008]. Use the small 'cross' horn with the wire through one of the holes nearest the boss, this uses more of the servo range and increases available torque and hence tendon pull. 01Mar08 Photo #32 - Recomended enhancement [1 March 2008]. 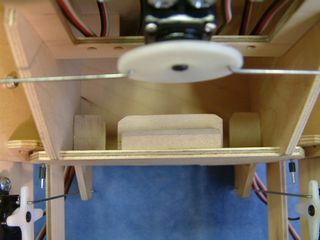 Add a 10mm dia 1.5mm (1/16inch) thick plywood washer between the bottom bearing on the Hip and the Body-bottom. This removes up and down play at the hip pivot and aides smoother walking. 05Feb08 photo36 flipped left to right to show attachment of links to servo disc in accord with new TECFOOT.BS2, splayout is +ve. 12July05 Software section added and TecFoot.BS2 file hyperlink added to index. 10July05 html cleaned up, some &AMPnbsp and NOSAVE removed, document date added. as a line in 'head' prevented IE6 from displaying TecFoot.txt when selected in Menu!